The American Revolution refers to the war between Britain and her colonies in North America which had united in order to be free of the British Empire, King George II, and the stifling taxes which were levied upon them. The colonists won their independence and united to form a republic which they named the United States of America. Had he been born in another time period, John Adams would have been lauded by all the world as a genius; but he was born in an era in which people like Thomas Jefferson, Patrick Henry, Thomas Paine, and even his cousin Sam Adams lived. 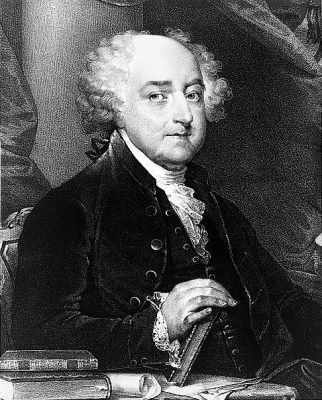 John Adams was born to a Puritan family whose descendants had come to the Massachusetts Bay Colony in 1638. His father was a deacon in the Congregational church as well as a farmer and a lieutenant in the militia as well as supervising roads and schools and being an elected selectman in Braintree. His mother was descended from the a long line of medical professionals from Brookline, Massachusetts. Clearly, John Adams had a great role model and a lot to live up to. Although they were monied, his parents raised him and his brothers in a modest fashion, and they maintained a strict adherence to their Christian faith. His family had no slaves, despite the fact that they were well-off enough to afford them, and John was one of a small handful of America's founding fathers who never owned slaves. John went to Harvard when he was 16. His father wanted him to be a minister, but he did not feel that was God's will for him. He taught school for a few years in Worcester, Massachusetts, and eventually became attorney. A few days before he was to turn 29, John married his third cousin, Abigail, who was herself the daughter of a Congregational minister. Together they had five children: three daughters and two sons, one of whom would become a President himself in the nineteenth century. John's cousin Samuel Adams, the famed pamphleteer who was most influential before, during, and after the American Revolution, was a brilliant writer and orator. He inspired colonists throughout New England. Around that same time, fellow colonist Patrick Henry, after showing little interest in academics or in business, found himself married at the age of 18 and decided to study law. He did indeed study that subject, and after only six weeks of studying, he took and passed the Virginia Bar exam and became an attorney. Shortly after that, he was elected to Virginia's House of Burgesses. Patrick Henry proved to be an eloquent orator as well as a brave one, as evidenced by his speeches against the King's taxation scheme, the Tax Acts. When the Revolutionary War began, he led the Virginia militia, notably in the "Gunpowder Incident." Then there was Thomas Paine, whose political philosophical views inspired the soldiers in the Continental Army, as well as a generation of people in both America and in Europe. By chance, he met Benjamin Franklin in London in 1774, and Franklin helped him to immigrate to Pennsylvania from Britain, arriving in the Colonies just in time for the American Revolution. Paine published his first book, a defense of American independence from the British monarchy, "Common Sense" in 1776. Because of that book, he traveled with the army and published "The American Crisis", which inspired them further. And after that, "The Rights of Man," a defense of the French Revolution, which made him a wanted man in England but a hero in France. When Paine fell out of favor in France, he was imprisoned and while waiting for his own execution, he wrote "The Age of Reason," which was a brilliant book, though its anti-church message made him hated by many. His philosophy and his ability to articulate in in writing was yet another light which outshone John's light. John Adams was a staunch opponent of the British "Stamp Act of 1765," and was the author of the "Braintree Instructions," which was a direct defense of the rights of the colonists, and he delivered a speech before the governor and the council where he elucidated his assertion that taxation without representation was immoral. But surely the orations and blatant courage of Patrick Henry and the writings of Sam Adams made him feel inferior to those two men. After the Boston massacre in 1770, the British soldiers were unable to find anyone in the colonies to represent them. Until, that is, they found and asked John Adams to defend them. Although he feared that it would tarnish his reputation, John accepted the invitation, believing it to be immoral that any man accused of a crime should be the defenseless in court. Six of the soldiers were found not guilty and two were convicted of manslaughter instead of the original charge of murder. The total amount of legal fees he was paid was about the amount of money it would cost to buy a pair of shoes. John met Thomas Jefferson in 1775 in Philadelphia, where they were both delegates to the Continental Congress. They hit it off right away became fast friends as they worked together on the committee which was appointed to draft the Declaration of Independence. Jefferson was also a prodigy in practically every endeavor he undertook. He was a magistrate in Virginia, an architect, and a gifted amateur scientist. He is credited with inventing the wheel cipher which generated coded messages during the war; a wooden "plow of least resistance," which transformed agriculture until the advent of the iron plow; the modern-day sundial; the Great Clock, which tells both time and the day of the week and uses cannonballs and gravity to run; a ladder which he used to repair his clock and which eventually could be found in most libraries in the 19th century, and which folded up into something so narrow it looked like a pole; and, believe it or not, automatic double doors operated by a mechanism hidden under the floor. One cannot help but imagine the his disappointment when Tom was the one who essentially wrote -- and was credited with the writing of -- that document, and by the facts that Tom was a super genius to John's mere genius. They spent quite a few years not speaking to one another, though Abigail Adams maintained correspondence, which must have been even harder to take. Though the two reconciled a few years before their death -- on the same day, as a matter of fact -- it is clear from reading correspondence from the two of them that John Adams harbored some resentment against his closest friend. In fact, John Adams's last words, on July 4, 1826 were, "Thomas Jefferson survives." And even that statement was proven to be wrong, as unbeknownst to him, Jefferson had died around five hours prior to his uttering those words. Yes, it had to be difficult to be John Adams in an environment where geniuses abounded, where he surely felt out-performed and outshone. But he still remains quite likely the most principled founding father of the United States of America. Delves into the causes of the war, important battles, and the important people in the Revolution as well as those things which happened after the war, including the Treaty of Paris, Articles of Confederation, and the Constitution. The History Channel presents the background information about the American Revolutionary War with videos about the Declaration of Independence, George Washington, and the Battle of Yorktown. Ancillary site for the PBS program about the Revolutionary War includes background information, links to off-site resources, a teacher's guide, and companion products. Contains information about the U.S. War of Independence, revolutionary music, and suggested reading. Also shares details about battles in the war, biographical profiles of commanders and other important people of the Revolution. Explores the period of the Revolution, beginning with the English colonial years, the causes of the inflict, and the war, as well as the birth of the new nation and a picture gallery of George Washington. Search for American Revolution on Google, Bing, or Yahoo!